I know I said I was taking a blog hiatus. That I was on a deadline and way behind with all-the-everything, and that until I got caught up and mailed stuff and finished my draft, I wasn’t going to be doing much of anything else. But here’s the thing. I have a book coming out in a month! To preface what will surely wind up being one giant disorganized ramble, I just want to say that I have the most awful time talking about my own books. It is sort of like when I talk about other people’s books, only even less coherent, with even more spoilers. There’s this thing that I get asked about periodically—mostly by people at events, where I don’t have adequate time to gather my thoughts, and then I flail around and give terrible answers, but the thing is, I KNOW the real answer. Sometimes I just can’t figure out how to say it right. The thing people get curious about is, how much of what I write is based on my own life. Now, if we’re talking about The Replacement, the short answer is … none. As anyone who reads my high school posts could tell you: the real, actual-person teenage-me had very little in common with Mackie Doyle. And by very little, I mean that she probably would have stared blankly at him, blinked in confusion a few times, and then wandered away to eat Skittles and make up mathematical postulates about emo boys with hoodies and persecution complexes, and think critical, judge-y things about Sid Vicious, who died before she was born and is not around to defend himself. She was kind of pitiless and cynical that way. Also, fine, yes, I’ll admit it—the wry, loyal, affectionate dynamic between Mackie, Roswell, and the twins is loosely based on a lot of guy-friend-groups I’ve known, so that part is totally something I stole from real life. In The Space Between, one could argue that I put a decent (ish) amount of my adolescent self into Daphne, and that seems pretty true. She’s curious. She’s dispassionate and analytical. Occasionally callous, but also benevolent. She’s that fish out of water who doesn’t really care that there’s no water. Other parts, though, are totally, totally made up. For instance, the part about being the daughter of the devil. But Brenna, you say, because in my imagination you are helping me stay on-task, Brenna, what about Paper Valentine? And I devote some serious thought to your question, and then conclude that my main character, Hannah Wagnor, is yet again nothing like me. However, many other things in this book are true. I wrote Paper Valentine because I grew up in a city very much like Hannah’s fictional city of Ludlow—clean, sprawling, suburban, full of city parks and open spaces. It’s routinely ranked as one of the most livable cities in the country. It’s really very lovely. I wrote Paper Valentine because even though it’s a very lovely city, we still had bad years. Because once a guy was dressing up as a cop, pulling girls over and killing them. And once the Dutch Elms all got sick and died, and a man was breaking into girls’ houses and the reservoir dried up and the state park was on fire for so long one summer the whole sky turned red and ash rained down like snow and once the birds got sick and died and the creek flooded and washed a train off the tracks into a trailer park, while my friend Tony stood outside of Chuck E. Cheese in a mouse costume with a cigarette in his hand and watched it happen, and so a lot of my memories feel very surreal. Paper Valentine is about those feelings. Not those actual things, but about the way bad things can happen in nice places, and a city can become a kind of bright-and-dark fairyland and there’s nothing you can do about it but grow morning glories on your balcony and eat snow-cones and drive around and not pull over for cops unless it’s in a public place, and even though it’s insanely hot out, you still lock your windows at night. So those are some true things—some feelings I put into the book, even if I didn’t put them on the page—but the truest thing of all is that my aunt and uncle own a photo shop, where I worked for most of college. Which means the part about the crime scene photos—that part’s true. The thing about the crime scene account is, nothing shows you faster or more clearly what your city is actually like. When you do the crime scene account, you always know how many people have died. You know when and where. Even the ones that didn’t make the papers. You know how many assaults happened last week and how many break-ins and drunk and disorderlies, and what it looks like when they have to use the jaws of life to get you out of your car. You know the dark corners of a city—how the inside part doesn’t always match up with the surface. You know that even though you’re quick and methodical and really good about case numbers and multiple sets of instructions and never accidentally giving the original negatives to the assistant from the DA’s office, you’re mostly only in charge of the crime scene account because you’re the one who doesn’t wind up sobbing in the bathroom, which makes you feel a little bit like a sociopath. And okay, fine. That last part is not in the book. But still, it’s where the book came from, along with all that other stuff. This entry was posted in Paper Valentine, Writing. Bookmark the permalink. First of all, insanely excited about Paper Valentine. From the tiny bit you’ve shared, it sounds like an amazing book. The town where you grew up does sound like something out of a book. I don’t suppose you had a slag heap there that may or may not have led to an underground world? 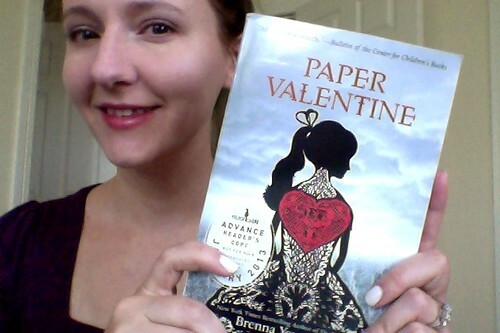 Is there any way that people outside of the US can get an ARC of Paper Valentine? As far as ARCs go, unfortunately, I think your best bet will be to see if you can beg one off someone online. Since PV will be out in a month in the US, UK, and Canada, the publishers are all about the finished copies now and I don’t think there are any more ARCs. Your penchant for parentheses is showing again, Brenna ;) Also, that book cover is gorgeous!